Linda Ronstadt’s third self titled solo album would effectively close the first phase of her career. By the time Don’t Cry Now was released two years later in 1973, her sound would be much smoother and honed to a degree, leading to her greatest period of commercial appeal. Linda Ronstadt continued her trend of gathering an eclectic mix of material from which to interpret. The sound was not as country oriented as her previous release, Silk Purse, but was rather more of a pop/country fusion. Many of the songs themselves had a country background, as did the instrumental backing, but her powerful voice was pure pop. Straight country songs such as “Crazy Arms” and “I Still Miss Someone” suffered a little from underproduction while Livingston Taylor’s “In My Reply” and Eric Andersen’s “I Ain’t Always Been Faithful” proved just a difficult match for her style. The most interesting track was the old Leadbelly/Woody Guthrie tune, “Ramblin’ Round,” which may seem an odd choice but she moved it over into her pop comfort zone. Overall Linda Ronstadt is somewhat unpolished and finds her not quite settled on a style. While it may not have the consistent level of quality that her next group of releases would attain, it does contain several excellent performances which foreshadowed some of the best crafted albums in pop history. It remains one of the lost albums in her long and distinguished career and is more interesting than it is essential. As the seventies dawned, Linda Ronstadt released her second solo album and the decade would prove very kind to her. By its end she would be recognized as a superstar in the music world. She would relocate to Nashville for the recording of the album and this move to the country capital of the world would be reflected in the music. This country sound would prove commercially successful as the album would reach the American charts and spawn her first solo hit single. Silk Purse may be country, but its major strength is the power and purity of Ronstadt’s vocals. She covers an eclectic group of songs with passion and preciseness. Producer Elliot Mazer provided the perfect background for her material as he combines fiddles, harpsichords, and other assorted instruments into an interesting and at times exceptional mix. “Long Long Time” was almost left off the album but it quickly became her first in a long line of hit singles. It featured a smooth vocal which would become a standard on her early solo material. The opening track was an energetic cover of the old pop-turned-country classic “Lovesick Blues.” Hank Williams had a huge hit with it in 1948, and Frank Ifield moved it over to rockabilly in 1962. Ronstadt’s version is a country pop hybrid that sets the tone for the album. Two early rock ‘n’ roll hits are moved over to a country/pop style. “The Goffin-King classic “Will You Love Me Tomorrow” and The Dale & Grace hit “I’m Leaving It All Up To You” feature a country foundation of fiddles, harpsichords, and pedal steel guitars with Ronstadt’s pop voice floating over the mix. There are several other fine performances. “Life Is Like A Mountain Railway” is a traditional bluegrass song which is given an almost spiritual quality. “She changes the Gene Clark and Bernie Leadon song “She Darked The Sun” to “He Darked The Sun” and takes it in a country direction. “Are My Thoughts With You,” written by Mickey Newbury, is a song that was made for her as she gives an exceptional interpretation. Silk Purse was a unique stop on the musical journey of Linda Ronstadt. In many ways it was a transition album as she was moving toward the rock/country sound for which she would later become famous. She may not have been a star at this point in her career, but she was able to produce a highly listenable and interesting album that has with stood the test of time well. Early 1969 found Linda Ronstadt leaving The Stone Poneys behind and embarking upon a solo career which would become one of the most commercially successful in music history. She would, over time, record dozens of albums, placing 36 of them on the national charts in the United States. Her singles, which charted 38 times over, would receive massive airplay during the seventies and eighties. To date, such success has garnered Ronstadt eleven Grammy Awards, over one hundred million albums sold, and recognition as one of the premiere female artists of her generation. Hand Sown … Home Grown was her first solo album, released in March of 1969. It was not an auspicious debut as it sold less than 20,000 copies and failed to crack the top 200 album charts in the States. What it did do, though, was establish her hybrid country/rock sound which she would hone to perfection during the next few years. The album is comprised of an eclectic group of songs, helping to establish her as an interpreter of other songwriter’s material. While the album would produce no enduring performances, when taken as a whole it comes across as a solid effort some forty years on. She tackles two Dylan tunes with good results. “Baby You Been On My Mind” and “I’ll Be Your Baby Tonight” are interesting interpretations as Ronstadt’s powerful vocals give them a different feel than the originals. The best tracks are her gentle renditions of Fred Neil’s “The Dolphins” and old band mate Ken Edwards “The Long Way Around.” Randy Newman’s “Bet No One Ever Hurt This Bad” served as a perfect vehicle for her to just cut loose and let her voice soar. Linda Ronstadt toured constantly during this period of her career, opening for such acts as Jackson Browne, The Doors, and Neil Young, building a fan base which would stay with her through the years. Hand Sown … Home Grown may not be her best album and probably doesn’t even rank in the top ten of her impressive catalogue. Still, for the initial release by one of the superstars of American music, it makes for a nice listen. B.J. Thomas’ career has now spanned four decades. And while he has released dozens of albums, he is probably best remembered for his hit singles. Songs such as “I’m So Lonesome I Could Cry,” “The Eyes Of A New York Woman,” “Hooked On A Feeling,” “I Just Can’t Help Believing,” “Mighty Clouds Of Joy” along with his two number one hits “Raindrops Keep Falling On My Head” and “(Hey Won’t You Play) Another Somebody Done Somebody Wrong Song” sold millions of copies and remain memorable decades after their release. Thomas’ musical journey began during the sixties in Houston, Texas with his backing band The Triumphs. He would issue twelve albums for the Scepter Label 1966-1973. Collector’s Choice has now reissued eight of these early albums as four twofers, comprising the complete albums plus some rare B-sides and a few unissued tracks to create 26 songs per CD. My first exposure to B.J. Thomas was the single, “Billy and Sue,” which was a top forty hit for a minor label. While it was not included on any of his early LP releases, it remains a wonderful artifact of the sixties and is worth seeking out. The first twofer, I’m So Lonesome I Could Cry/Tomorrow Never Comes, combines his first two albums which were both released in 1966. His first album is the better of the two, with “I’m So Lonesome I Could Cry” and “Mama” both becoming hits. The title song is a wonderful rendition of Hank Williams’ classic country masterpiece—and may be the best cover of this old standard—as he moves it over into a pop sound with a poignant and plaintive vocal. The album would also establish his relationship with songwriter Mark Charron who composed half of its original twelve tracks. As with many albums of this era there are a few covers of popular hits of the day. Wilson Pickett’s “Midnight Hour” and the Tom Jones hit, “It’s Not Unusual,” are competent but another Hank Williams tune, “There’ll Be No Teardrops Tonight,” is outstanding. Tomorrow Never Comes is a nice slice of mid-sixties pop but contains no big hits. Mark Charron composed nine of its twelve tracks here, the best of which are “Ashes Of Dreams You Let Die,” “My Home Town,” and “Candy Baby.” Other outstanding tracks are Thomas’ cover of the old country tune, “Tomorrow Never Comes,” and “Gonna Send You Back To Georgia.” All the material has been remastered and the sound is vastly superior to the original vinyl releases. An accompanying booklet presents a nice history of the two albums as well. I’m So Lonesome I Could Cry/Tomorrow Never Comes is a nice look at both the early career of a pop master and of sixties pop music itself. Both albums have been out of print for years and it’s nice to have them available again. Every once in awhile I drift outside of my comfort zone for a review and so it is with Daphne Willis. At my age I find I often get stuck in the past and stay with artists which I have become accustomed too. In this case my leap of faith has produced results, broadened my musical horizons, and expanded my comfort zone. Several years ago Daphne Willis was a student at DePaul University whose music career was secondary to her studies. In 2007 she released an independent five song EP titled Matter Of Time which caught the attention of Vanguard Records. Suddenly she had signed a recording contract and her music career became the primary focus of her life. The result of all this is What To Say which is her first full length album. Her sound is very modern and comes out of the Jack Johnson school of music. Despite her young age she has taken control of her career which in this case is a good thing. She composed eleven of the twelve tracks and co-produced the album. Her voice is a very effective instrument. It is a little out of the mainstream but has a soulful quality. She has been compared to Rickie Lee Jones and I think that is an accurate description. It is her songwriting skills and her ability to construct a song which makes her stand out. The lyrics have a depth and tell stories. I do appreciate her publishing the lyrics within a small fold out booklet which accompanies the CD. The music is intricate as there are tempo and beat changes yet it retains a melodic flow. The interplay of the instruments is creative and surprises lurk beyond each musical corner. A thumping bass lays down a foundation and a horn section provides effective flourishes and enhances the sound. It successfully treads the line between brash and intimate. What To Say is not only a good album in itself but bodes well for Daphne Willis’ future. She is currently out on the road touring and if she should come my way I may really go outside my comfort zone. 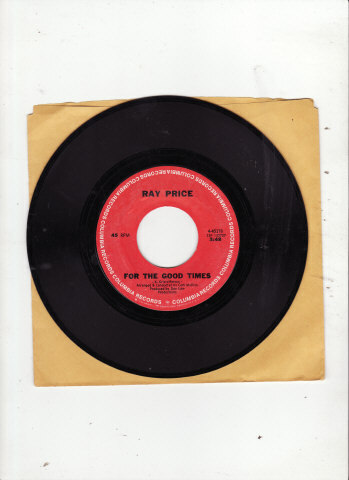 “For The Good Times” by Ray Price may not have been the first country record I ever bought, that honor goes to either Marty Robbins or Roger Miller, but it was certainly one of the best. I don’t know what Kris Kristofferson had in mind when he wrote this song, but Ray Price would turn it into one of the classic country tunes of all time. It and the album of the same name would reach number one on the country charts and the single would cross over onto the pop charts in The United States and reach the number eleven position. The album and single would win Academy Of Country Music awards. In addition Ray Price would win the Grammy Award for Best Country Vocal Performance. Ray Price would record dozens of albums and singles during his sixty plus year career but this wonderful ballad featuring his deep bass voice is definitive. Price is now in his mid-eighties and hopefully is still out on the road singing this classic song. The Everly Brothers had a top ten hit with the Phil Everly penned tune “When Will I Be Loved” in 1960. It turns out this was only a warm up for this now famous song. 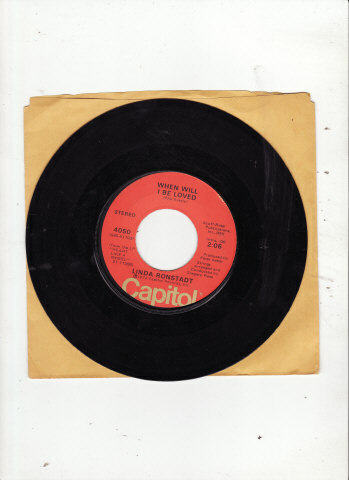 Linda Ronstadt would include the song on her number one album HEART LIKE A WHEEL. It would be released as a single and spend two weeks in the number 2 position on The American charts. Ronstadt would make the song a country/rock classic as she gave one of the best vocal performances of her career which is saying alot. Her solo vocal at the beginning of the song show cased her voice at its best. Over thirty years later it remains one of my top three performances by Ronstadt and is perfect uptemo radio fare. You are currently browsing the Muskmellon's Blog blog archives for February, 2010.